Vivarail has been chosen as preferred bidder to supply a fleet of Class 230 D-Trains to KeolisAmey for the Wales and Borders franchise. The trains will be the first to come into service as part of the new franchise and will demonstrate KeolisAmey’s commitment to providing new, high quality rolling stock to Welsh passengers. Adrian Shooter, CEO of Vivarail, said “This is a very exciting day for us and we are proud to be supplying the first of the new trains for Wales. “We know that KeolisAmey want to bring the best new trains to their passengers so our interior layout has been designed to do exactly that. As well as the wide and spacious carriages the trains will have a Universal Access Toilet, WiFi, air conditioning, USB ports and 3-pin sockets. There will be a range of seating layouts and plenty of space for bikes and luggage. With KeolisAmey we have been determined to give passengers the very best travelling experience and the trains they deserve: modern, comfortable, reliable and environmentally-friendly. “In conjunction with our partners at Creactive we have worked on a livery design that will be seen across the whole fleet. “Our aim has always been to provide innovative solutions for operators and to that end I’m delighted to announce that our trains will be built as battery/diesel hybrids to cut down on emissions and make use of the exciting new technology we have developed over the past two years. As the UK’s leading battery train manufacturer we know that emission-free trains are the future and we will continue to spearhead that development. With this hybrid fleet we will deliver a train that is clean, green and reliable making use of GPS systems to cut out the engines in stations and environmentally-sensitive areas. “Our trains will come into service in summer 2019 and will form the flagship fleet for Wales and Borders and I look forward to taking the first journey in North Wales next year. Colin Lea, Mobilisation Director, KeolisAmey Wales Cymru, said: “We are proud to announce that KeolisAmey and Vivarail will provide a step-change in passenger comfort and service quality on three North Wales routes (Wrexham-Bidston, Conwy Valley, Chester-Crewe) by introducing these units, fitted with the latest passenger comfort appliances such as power supply at all seats, high-speed Wi-Fi, air-cooling, bike spaces, and a brand new seating layout reflecting the needs of the passengers on these routes. Design and build of the 3-car trains is already underway at Vivarail’s two sites and orders have been placed with the leading supplier of Universal Access Toilets based in Cwmbran. The fleet of 5 trains will move to Wales for final testing and commissioning in early 2019. Vivarail has completed its first entirely battery powered train and is making progress with the first diesel-powered class 230 set for West Midlands Trains. The new battery-powered train has been developed by Vivarail. The train is equipped with battery modules, each containing 60 24V Valence Lithium-ion batteries supplied by Lithiumwerks, which replace the diesel power-packs used on the diesel version. equipment, motors and bogies as the diesel variant. Two battery packs are fitted to each car instead of four diesel power units, giving a similar net weight, although the diesel train has to carry the added weight of the fuel tank and fuel. Following test running and public display/demonstration passenger service at the Rail Live event at Quinton Rail Technology Centre at Long Marston in June, Vivarail expects to begin testing the battery train on the main line network. The battery train is designed for relatively short distances with an anticipated range of 48km between charging cycles, which can be completed in around five minutes. Vivarail has developed a rapid charging system incorporating power supply via a conductor rail, which is only live when the train is stationary above it. Early test running has demonstrated that the battery train can accelerate at around twice the rate of the diesel variant. Vivarail says the diesel train can be converted to battery (or vice versa) in one day using a fork lift truck as both diesel and battery modules are designed around standard forklift pallet sizes. The diesel fuel tank can be added or removed as required as part of this conversion. 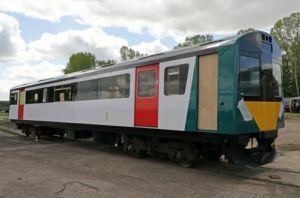 Vivarail has developed a diesel/battery hybrid design for the D-Train and is also working with British industrial gas specialist BOC to develop a hydrogen fuel cell version of the class 230. The company is seeking government research funding to develop a prototype train. 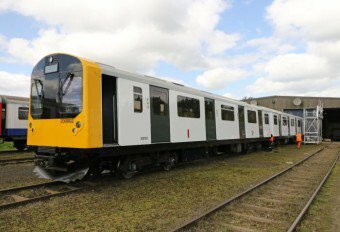 Meanwhile Vivarail has also commenced work on all three class 230 DMUs ordered by West Midlands Trains for use on the Bedford - Bletchley line. These are based on the original diesel Vivarail class 230 prototype. The three trains will be available for driver training by August with entry into passenger service scheduled for December 2018.